Also serving communities of North Miami Beach. There are 78 Assisted Living Facilities in the Aventura area, with 4 in Aventura and 74 nearby. The average cost of assisted living in Aventura is $4,040 per month. This is higher than the national median of $3,346. Cheaper nearby regions include Hallandale Beach with an average starting cost of $2,150. To help you with your search, browse the 280 reviews below for assisted living facilities in Aventura. On average, consumers rate assisted living in Aventura 4.2 out of 5 stars. Better rated regions include Miami Gardens with an average rating of 4.6 out of 5 stars. Caring.com has helped 5 families in Aventura find high-quality senior care. To speak with one of our Family Advisors about assisted living options and costs in Aventura, call (855) 863-8283. Aventura, a suburb of Miami, Florida, is known for the shopping center Aventura Mall and championship golf courses. There are three assisted living facilities (ALFs) located in Aventura and 56 nearby in Hollywood and Miami. These ALFs are licensed by the Bureau of Health Facility Regulation of the state’s Agency for Health Care Administration. Under a standard license, ALFs in Florida provide a range of care and/or nursing services for one to several hundred residents in homelike, non-restrictive settings. They may be granted specialty licenses for additional, specific services other than routine personal care which are limited nursing services (LNS), extended congregate care (ECC) and limited mental health (LMH) services. In Florida, there is no tax levy on income, social security benefits, pensions, retirement account withdrawals and sales on groceries and medicine, making the state financially favorable for seniors and significantly compensating for Aventura’s relative high cost of living. Aventura has a higher crime rate than 91 percent of communities within Florida. This number pertains to the city’s non-violent property crime incidents such as burglary, larceny and vehicle theft. The planned community of Aventura is somewhat walkable and has a bike-sharing program to promote a healthy, environment-friendly way of mobility. Free rides with six routes around the city are offered by Aventura Express shuttle buses, and seniors 65+ enjoy discounted fares on Miami-Dade Transit’s Metrobus and Metrorail rides. The Aventura area is home to world-class medical facilities including Aventura Hospital and Medical Center and Chen Senior Medical Center in Mount Sinai Primary & Specialty Care Aventura in the event of medical emergencies or illness. Aventura has an array of community resources for seniors, including the Senior Support Services Division of the Jewish Community Services of South Florida, an organization that serves Jewish and broader communities throughout Miami-Dade County, giving aging residents free transportation, kosher meals, shopping assistance, counseling and other volunteer services. Assisted Living costs in Aventura start around $4,040 per month on average, while the nationwide average cost of assisted living is $4,000 per month, according to the latest figures from Genworth’s Cost of Care Survey. It’s important to note that assisted living rates in Aventura and the surrounding suburbs can vary widely based on factors such as location, the level of care needed, apartment size and the types of amenities offered at each community. 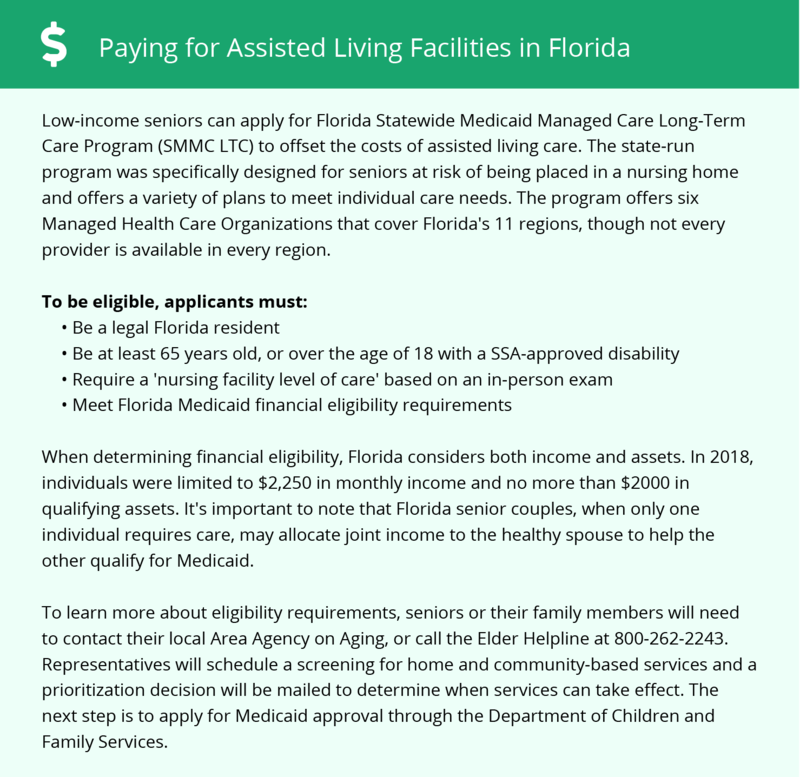 Florida’s Medicaid program covers the ALF costs in Aventura for eligible seniors through either of the state’s Home and Community-Based Services (HCBS) waivers for Assisted Care Services (ACS) or Long Term Care. Aventura and the surrounding area are home to numerous government agencies and non-profit organizations offering help for seniors searching for or currently residing in an assisted living community. These organizations can also provide assistance in a number of other eldercare services such as geriatric care management, elder law advice, estate planning, finding home care and health and wellness programs. To see a list of free assisted living resources in Aventura, please visit our Assisted Living in Florida page. Aventura-area assisted living communities must adhere to the comprehensive set of state laws and regulations that all assisted living communities in Florida are required to follow. Visit our Assisted Living in Florida page for more information about these laws.